All but REQUIRED expansion of the kingdom-building rules - a must-have! The first proper supplement for Ultimate Campaign’s innovative crafted by Legendary Games is 48 pages long, 1 page front cover,2 pages of editorial, 1 page SRD, 1 page ToC, 1 page introduction, 2 pages of advertisement, 1 page back cover, leaving us with 39 pages of content, so let’s take a look, shall we? I’ll do it similar to the introduction of this book and go off on a slight tangent: I LOVE Ultimate Campaign. It’s not perfect, but the sheer fact that the rules allow for PCs to properly influence and guide the fortunes of organizations, cities etc. is glorious and helps much with the concept of immersion. So what does this expansion offer? The first component introduced herein would be edicts, of rather modifications of edicts: Alternative expansion, taxation and holiday edicts are provided and offer more variety and control than their default versions: Weekly holidays may for example cost 1d12 BP, but they also offer +2 to economy and +4 to loyalty… Nice modifications for the standard edicts and ones that should not overexert anyone’s ability to implement them. We also are introduced to a series of special edicts that can be grouped in 5 fields – commission, endowment, espionage, festival and recruitment edicts. The respective edicts are smart and make sense: For example, take the endowment edict – it may result from the noblesse oblige event and provide +1 loyalty and fame, but also increase consumption by +1 – and if you fail to pay for the endowed building, you run the risk of gaining 1 point of unrest on a failed loyalty check… Espionage is also rather awesome, if I may say so – from the alignment and levels of vital players/rulers of nations to general levels of unrest, there is a lot that can be gleaned and options to support organized crime, ferment unrest, bribe merchants – it’s all there for the taking! What also deserves special mentioning in my book is the fact that all PC-classes can be “built” as elites by providing the adequate prerequisite buildings. Now one personal minor gripe I had with the basic kingdom building rules seems to have been shared by LG’s design-team and we thus also are introduced to a variant rule that eliminates the attribute modifier from the respective ruling positions and instead makes a value of 13 a prerequisite. Instead, skills count for more in the respective area of expertise, which, at least to me, makes infinitely more sense – so kudos for that and making magical items with attribute boosts matter less in the grand scheme of things. Now on the fluffy side, having kingdoms, land and vassals also entails a certain amount of status and thus, titles – mostly neglected in the basic rules, we get a nice, concise breakdown of kingdom sizes, domain names, typical titles of the respective rulers and honorifics: Beyond European-inspired lists, we also cover middle-eastern, asian, ecclesiastic and Greco-roman titles and finally, even a collated table. Now every realm requires cities and similar settlements – and some places are safer than others. Hence, we get a neat table to modify population-size by terrain and factor modifications of danger by terrain type into account as well – and yes, settling in the underdark is damn dangerous. Via farms, fishereies, watchtower etc., these can further be modified and sample settlements,. Once again, we get optional rules as well and oh boy, do I like them: Where limiting exotic goods seems logical, the second one provided is gold: We actually get a concise way of limiting consumable magic items – which is awesome. Why? Well, if you haven’t noticed, their pricing tends to be balanced with costly material components that don’t fracture into the GP-limit-determined availability, resulting in powerful magic being potentially available in ridiculous breadths. Well, with some concise rules and a small table that particular jarring blemish is gone., especially since part two of that issue, the restriction of caster levels, is addressed as well. Compared to those optional rules for secret markets for magic items and a smart limit on spellcasting services available may be less interesting, but still welcome – at least on my table. Speaking of cities – building them was never as easy as with this book: With the extremely helpful massive table of buildings tec. by base-cost and how long construction takes etc. – duplicate buildings, restrictions, different building qualities – all in here. As is advice for luring the lines between city-building and customizing buildings to represent their neighborhood. Have I mentioned the new types of buildings? Tunnels and thankfully, finally also bordellos may now be constructed. Oh, and want to go kingdom-building Geb/Hollowfaust-style? What about having your own deathless labor force? Permanent Animate Objects? What about forbiddance or (un-)hallow effects? Or peculiarities like fertile land, natural crossroads and the like? There is quite an array of potential at your beck and call, if you choose to make use of it. Now where the pdf goes above and beyond is with uncommon settlement-types – cavern cities, cliff-side settlements, barge cities, treetop villages – all come with their own restrictions and challenges to make sure that your exotic settlement does indeed reflect its uncommon nature in the rules as well as its fluff – two thumbs up! Another expansion herein that we imho were in dire need of would be danger-levels by area and thus kingdom and settlement events – events are now grouped as beneficial or dangerous, modified by danger modifiers and come with their own tables that make determining proper events much faster and also more logical. We also get a broad range of different settlement qualities that allow for e.g. the settling in old ruins to be possible and civic attributes also feature in a concise, massive table – which btw. includes e.g. sacred animals, anthropomorphizing auras, a magical aura that makes animals talk, existing in a pocket dimension, being unaging/eternal (great to build e.g. ancient bastions akin to Anor Londo) or make your settlements wild magic zones or bureaucratic nightmares –all can be found herein. Beyond this vast amount of options, we also get lavishly drawn building tiles in full color as well as an index of tables. Editing and formatting are top-notch, I didn’t notice any glitches of significance. Layout adheres to LG’s two-column full-color standard studded with thematically fitting graphical elements. The pencil-drawn artworks by Frank Hessefort and Mike Lowe in full color at first took me a bit to get used to, but their sheer amount of detail and precision let them develop a nice, unobtrusive flair that complements the supplement rather nicely. The building tiles are top-notch. The pdf comes fully bookmarked and in two versions, with the second being more printer-friendly than the default pdf. Jason Nelson has delivered a supplement with this pdf that is all but REQUIRED for Kingmaker and any supplement using Kingdom-building-rules – this pdf provides options upon options, many of which allow you address some of the weaker aspects of the base system. Furthermore, the added content, with all its options and iconic possibilities does quite a nice job at providing a myriad of possibilities. If this pdf made one thing clear, then it would be that these rules not only can use expansions, they provide fodder galore for even more supplements. 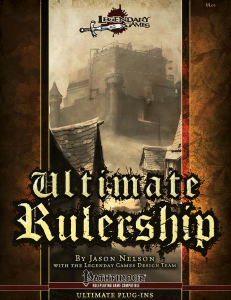 Ultimate Rulership is an awesome, if not particularly cheap supplement that is worth every cent for its well-crafted amount of crunchy content, with my one gripe being that there is still quite some ground to be covered – perhaps a sequel is in order? My final verdict will clock in at 5 stars + seal of approval for a glorious supplement indeed that should make any kingdom-building experience more rewarding and which should be considered all but required for any prolonged use of Ultimate Campaign. You can get this superb supplement here on OBS and here on d20pfsrd.com’s shop!